Listen to this song by jazz pianist and composition student turned new wave figurehead Joe Jackson. It’s “I’m the Man”, the title track to his second album from 1979, recorded a mere 18 months after his first. 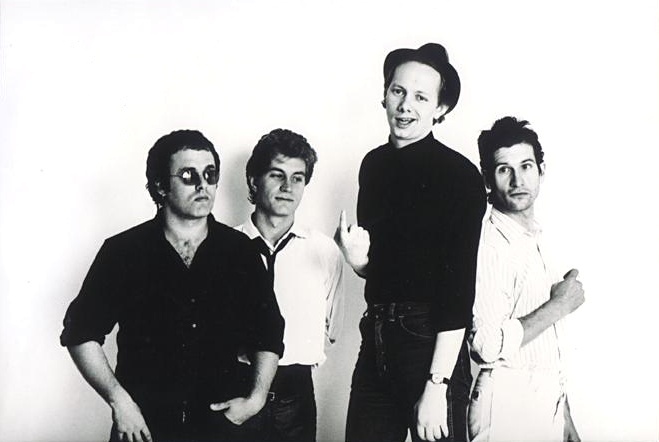 Joe Jackson and his band, particularly bassist Graham Maby, had done the rounds as a club band while Jackson attended the Royal College of Music as a composition student during the day. In this, Jackson lived a sort of double life musically speaking. By 1979, his approach was that of a pure guitar-bass-drums, with pub rock overtones, scathing lyrics, and spiky punk-inspired attitude. As a ‘serious composer’ you might argue that he was slumming it, if the band weren’t so tight, so professional. Even if Jackson aspired to George Gershwin levels of musical ambition, his musicianship and that of his band proves that their expectations of themselves for rock ‘n’roll is just as dedicated. It’s clear that even early on, Jackson saw nothing lesser about pop music, unlike many classically-trained musicians. Just listen to this thing. Jackson’s heavily ironic attack on consumer culture is accompanied by Graham Maby’s bass which sounds like the strings are going to fly off of it any second. Gary Sanford’s surf-guitar pins everything to the wall particularly during the economic solo. And drummer Dave Houghton sounds like he’s got a vendetta against his drum kit – he’s just punishing it on this track! It’s hard to believe that rock ‘n’roll had once been only a second career at one time for Jackson. Although, by ’79, he was fully engaged with the star-maker machinery after his breakthrough debut, and his single “Is She Really Going Out With Him?”. He’d go one more straight-ahead rock record (and even then, he mixed it up) before jumping the stylistic rails by 1981 and recording a jump-jive album (!). Joe Jackson would eventually bring his two worlds of composition and rock ‘n’ roll together on record, initially with his masterpiece Night & Day, which is one of my ‘save it from a burning house’ albums. After that, he would still jump from one side of the fence to another, sometimes with middling results. But, that’s one of the things which makes him an interesting artist. He takes chances, and keeps moving in unexpected directions. Jackson recently reunited with Graham Maby and Dave Houghton for 2008’s Rain album, which is a knock-out. It too is kind of unexpected, since it kind of comes off as a jazz trio doing a pop-rock record in the best sort of way. Investigate more of Joe Jackson’s world by visting the Joe Jackson website. I’ve always taken it as Joe Jackson was one of those guys who played pop music in order to pay the bills. I think you’re right in practice, of course. I think the dividends of Jackson’s pop career has certainly allowed him to explore other areas. But, even from the beginning, he was quoted as saying that Gershwin made a career making pop as well in composition, and that he wanted to forge a similar career making music of equal artistic value in both arenas. John, thanks. That’s a great site. The photo I’ve inserted above links to it as well.